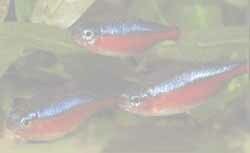 Q: I have a 4 month old freshwater, 20 gal. acquarium containing one Red Wag Platy, one Mickey Mouse Platy, two Red-Eye Tetras, two Black Skirt Tetras, four Striped Danios, two Harlequin Rasboros, two Endler's Livebearers and one algae eater. All have healthy appetites, water tests just fine, 25% water changes are performed monthly (altho' this usually kills at least one fish). My problem is that I enjoy the Platys because they add color to the tank. However, each time I try to add a new fish, it dies. All current tank residents are fine, no signs of illness, but new Platy or Sword arrivals die within a week.Whats going on? A: It sounds like a pH problem, what is the pH of your tank, your tap water and the LFS water? are they close. The current inhabitants of you tank could have adapted to a low/high ph over the time period, but any new ones would be "shocked" when added. Also the fact of at least one fish dying during a water change also leads me to believe this. are you also using a chlorine remover when you make changes?.